The Alarming Company is one of the largest providers of security, CCTV and access control systems on the south coast. We work with large organisations, small businesses and private individuals to protect the things that matter most. We all want to feel safe. We also need to protect the things that matter to us – whether at home or at work. Although there are a large number of companies that can offer to help, the choice can sometimes be daunting and confusing. Our aim is to cut through all of the jargon and sales talk. 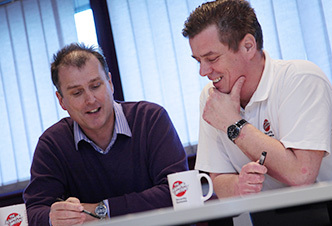 We take time to listen and understand your particular requirements. We devise effective solutions and explain them in plain english. And then we install and maintain your chosen system with the minimum of fuss. All of which to give you the peace of mind that what matters most to you has all the protection it needs. Established by Ian and Alistair Austin in 1989, The Alarming Company is now one of the largest security companies on the South Coast. For over twenty-five years we have worked with large organisations, small businesses and private individuals to protecting people and properties. Still owned and managed by Ian and Alistair, we now employ some 50 staff and are based in Fareham, Hampshire. The Alarming Company is approved to the Government’s NSI Gold standard. Read what this and our other accreditations means for you.